If there was one thing that my son could ask me to do with him that I wouldn’t think twice about, it would have to be coloring. Coloring can mean so many things to individuals of all ages. For many it is very calming and therapeutic. Whether you are 2 to 93, coloring is plain old good fun which allows ones artistic side to come out. Coloring provides opportunities to visualize patterns and to develop ones fine motor skills and hand-eye coordination. Knowing the power that coloring has for Applicable2U, we knew that Click ‘N’ Colour for your iPad device was an artistic app that we needed to explore and review for our readers. Currently, it is only available on the iPad device running iOS 4.2 or later. Click ‘N’ Colour is a free download and comes pre-installed with seven pieces of work created by Australian artist, Debbie Neale. As you get your finger tip “virtually wet” from the color palette, her drawings will take you back in time, with a very hippie, retro feel. Additional pieces of work, Hippie Alphabet and a premium upgrade version, can be downloaded to your device as an in-app purchase of $2.99 for each. 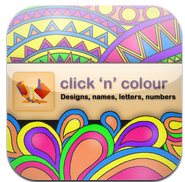 Click ‘N’ Colour has a very easy to navigate menu which allows you to flip through your “coloring book”. As you would push down on the crease of a real coloring book to get yourself ready, tap the coloring page on your mobile device screen that you desire. Once on that page, artists will have a number of usable features at their finger tips. At the top of your coloring page, users will see a drop down arrow. In this menu, images can be saved, emailed, and shared via two social networks: Twitter and Facebook. At the bottom right hand corner is the painters palette with colors ranging from primary, secondary, warm and cool colors. When reviewing Debbie Neale’s work, you will notice that she incorporates a great deal of detail, both small and large. To ensure that colors are placed in the desired location, another very useful feature is the ability to incorporate the pinch and zoom gesturing that the iPad has to offer. This magnifying feature will come in handy as artists are filling in the tiniest of places, what we call the “nooks and crannies” of the page. The works of art that you will create while using Click ‘N’ Colour could take several hours or even days to complete. Knowing the amount of time that you will put in to finishing, there is no need to panic if work isn’t finished in one sitting, your master piece is saved locally to your device. While working or as you return to work, if you find a mistake, simply tap the correct color in your palette and replace the incorrect color, developers have chosen this method over an undo button or the option of wiping out the entire page. A thumbs up in our book! For those readers that decide to download Click ‘N’ Colour, it is important to note that developers, Creative Intersection, have noticed some issues with those running iOS 5.0 where a section of the picture can go blank when filling it in. We did experience this issue, however, through our persistence and a little zooming in, the filling feature did in fact work. Developers are aware of the problem and are working on fixing it soon. As Applicable2U had their therapeutic time today with Click ‘N’ Colour, we were reminded of our own childhood drawing. As a child, I would take a blank piece of paper, place my pencil somewhere on the page and just begin swirling the pencil tip in every direction, crossing over lines and making a variety of shapes in the process. Once I was happy with my design, I would then begin using various coloring tools: markers, crayons, or colored pencils to bring my piece of art to life. We were amazed to see this same idea in Debbie Neale’s work via the mobile device. All good things make their way back, but now it is happening through the help of technology, not fashion. Click ‘N’ Colour definitely gets the Applicable2U approval!! As stated in their iTunes description, additional designs will be added soon, so stay tuned for future updates. If you would like to learn more about Debbie Neale and her work, please visit her website here. To get your artistic groove on today for free, then click here to access Click ‘N’ Colour from your iTunes library. As a learner what strategies work best for you? Are you left or right brained? At this point are you wondering what that means? If you are left brained then you like talking and writing, you are a planned and structured person and tend to control your feelings. If however you are a right brain individual then you are spontaneous, prefer drawing and manipulating and respond well to demonstrated instructions. iMagine Machine creator of Faces iMake have your hemispheric dominance, right or left brained, literally in the palm of your hands as you explore your creativity via your iPad device running iOS4.2 or later. The creative juices of this application was developed alongside renowned artist, educator and author, Hanoch Piven. Faces iMake integrates a creative style of art as it entangles various benchmark assessments necessary for elementary students. It explores various elements and principals of design: color, line, shape and space. As we explored this multi-purpose application, we were intrigued to see in their About, a word cloud, Wordle describing what Faces iMake is capable of doing for your child(ren) or students. iMagine machine describes this application as mind opening, original, social and provides the user an opportunity to try things. It is an application that meets a child’s multiple intelligences. To get started, users might find it helpful to explore the five pre-installed lessons. Begin to develop your 21st century skills as you think outside the box. Amazingly, Faces iMake has no right or wrong answers, it’s all about expanding your imagination. Immediately, users will notice the various toolbars that can appear and disappear as needed. Whether you are right or left brained, users may need some inspiration. Click the “gallery” button and a sampling of twelve pieces of art are there to spark whichever side of your brain. As you create, “bebop” to the default application sounds or link to your own music. Simply click the “plus” sign and your library of music will appear. It is preloaded with a large library of clipart in such categories as: candy, toys, food and base templates. In addition, users can incorporate their own objects by using the device’s camera. Use those images already in your iPhoto library or shoot now. The opportunities are endless. No matter where you piece of art comes from, it can be manipulated in a variety of ways. As art is dropped onto the green canvas, users will immediately notice a dotted circle and a new toolbar. Images can be cloned, locked in place, reversed, stacked, deleted and rotated. Users will be manipulating and developing their fine motor skills as they make tapping movements like pinching, expanding and dragging. As you imagine, build, giggle and smile, your artist does not have to be finished just yet. Creations can be saved and shared to your iPad, emailed or posted to a Facebook account. If however you want to take it one step further, share it via Tap2print. Tap2print will turn your creation into a puzzle that can be purchased. The artist inside you can now be manipulated in a whole new way. An artist does not have to have a paint brush in their hand. Art is taught in a variety of ways and Faces iMake is making that possible. As a parent and educator, Applicable2U is impressed with the educational possibilities that this application has to offer. Whatever your child or student “imakes” it can then be integrated with a creative writing piece, thus stimulating those left brained students. As we tried new things with this application, Applicable2U would definitely give it two thumbs up! This is an application that does not focus on a particular age group, it’s for all to enjoy and learn from. If you would like to learn more about iMagine machine, please visit their website here. What faces do you make? Put them to art today by downloading Faces iMake HD to your iTunes library today. As a child, whether you had a box of Crayola crayons or some other generic brand, the thought of blending colors to create something new would intrigue just about anyone. Now with the help of an educational app called Color Mix for Kids HD, technology and creativity will come together in one simple download. With only a painters palette for mixing, multiple types of canvases, a sponge and four primary colors, early elementary students will feel like an artist. Color Mix for Kids HD is not only fun to explore, but it also meets a number of academic requirements beginning at first through fourth grade. With a very clean design as you navigate from page to page, users will quickly understand through visual clues or buttons what choices they have that will encourage or develop their artistic side. This educational app is suitable for both home and school use. To begin creating, simply tap the painters palette. Here users are given the four primary colors: red, green, yellow and blue. The primary color toolbar is referred to as the mixing bar. Immediately users can begin creating a master piece on the right hand side. To set themselves apart from other art applications, Eightfold Education has added the ability to have multiple fingers drawing at one time. A note to the developers – is it possible to have users each choosing their own color as they create at the same time? This would encourage and build the life skill of working together and collaborating. In addition, by selecting the paint palette button, users can explore and discover new colors. Through this discovery, users should recall various art terms learned such as: primary and secondary colors, warm and cool colors, analogous and complementary, or the color wheel depending on the grade level of the user. With very realistic paint blobs, budding arts can click on a color and drop it onto the mixing bar. If you want to remove or start a new color, simply tap the sponge to clean one or more of the mixing bar colors. Once the color exploration is complete, click the green checkmark to continue drawing. As pictures are completed, the user has the option to save their picture to the gallery, empty it into the trash can or to fix any mistakes. Free draw and this idea of color mixing provides an educator another way to assess their students understanding of key arts benchmarks in a less stressful way. Free exploration is not the only option that a user has within Color Mixing for Kids. For those not yet in school and those that are in school, they also have the ability to color in a variety of animal coloring pages and environmental science lesson connect the dot pages. A cross curricular application that also reinforces fine motor skills is definite bonus! Each can be saved to the applications gallery or to your photo album on your iPad device. If desired, these pages can then be emailed, printed, assigned to a contact, turned into your wallpaper or copied. In addition, users can choose from 32 different backgrounds to extend their free drawing experience. A note to the developer – might it be possible to choose different sized paint brushes as children are manipulating the coloring and dot to dot pages. With this incorporated additional art standards would be mastered. Overall, Applicable2U gives Color Mix for Kids HD a thumbs up! It provides the user an educational, interactive, and fun experience. If you like what you see now on this version, just wait until you see some of the upcoming updates. To learn more about Eightfold Education, please visit their website here. To encourage learners in a variety of ways, begin downloading Color Mix for Kids HD as a way to bring out the artist inside of them. As school districts begin to implement iPads within individual classrooms or even an entire building, Applicable2U has begun to explore how the use of mobile learning devices can be applied to the integrated arts. In my school, integrated arts refers to physical education/wellness, general music, and art. 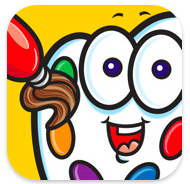 For now, our exploration will focus on the arts with educational app 1-2-3 Draw which provides a step by step guide on how to create cartoons and illustrations. This isn’t just any drawing application, with guidance from well known cartoonist, Steve Barr and illustrator, Freddie Levin, an art class can have a whole new twist. How Does It Work: 1-2-3 Draws offers two styles of learning to become an artist: cartoons, illustrations and a bonus area – free zone. Initially the application is preloaded with lessons. However, additional lessons can be purchased and added. All artists carry around their master pieces in a notebook. The artist hiding inside of you can now carry just your iPad. The notebook is laid out very clearly. The right hand side is the creation page, while the left hand side hosts the step by step directions with a coordinating illustration and written directions. If directions are missed, users have the option to flip back and forth as needed. If at any time you run into a problem, the “question mark” button works as a handout tutorial. Amazingly, this educational app incorporates many of the necessary art tools. Such tools include a background grid, two types of writing utensils with ability to alter its color, thickness, and opacity. With budgets tight these days, think of the money that will be saved when certain supplies will no longer need to be purchased. On one iPad, a parent or teachers can set the ability for 1-2-3 Draw to host multiple artist accounts. As chosen lessons or free zone drawings are completed, work is saved and can be shared with others via email. To further extend this application into an educational setting, it would be great if work could be saved as a PDF file where multiple users work could be linked and shared via a classroom webpage. Another option which would add educational benefit would be the ability to save drawings as a jpeg file which could be inserted into a iWork file on your iPad device. Over the years as old and new projects have been developed, the art curriculum has found its way into various educational areas outside of the art room. 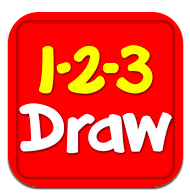 For those schools that already have iPads, 1-2-3 Draw has a great deal of potential for both personal and educational reasons. Science, Writing and 1-2-3 Draw: Currently, while working with various educators, students will research a particular plant native to the New England area and create an accompanying poem, typically an acrostic or free verse, which is then word processed. Is this true technology integration? No! This project could incorporate technology more effectively from start to finish with the use of an iPad, web browser, 1-2-3 Draw app, and iWorks Pages app. With the librarian and instructional technology specialists support, curriculum links would be preset for our late elementary students on our schools web page. After research is complete, students would begin brainstorming ideas for their poem with the help of Pages. As the research and writing pieces are finished, Applicable2U can now see the implementation of 1-2-3 Draw. Incorporate with this science/writing project an authentic student illustration of their plant. Students should recall those art standards/skills that have been met over the year as they transition them from paper/pencil to interactive drawing via mobile learning. Simply enter the free draw zone and let your fingers do the work! Finished artwork can be saved, emailed to the classroom teacher and then printed. If however, the developers are to implement into a future update the alternative sharing options, authentic illustrations could then be inserted directly into the Pages app. Writing and 1-2-3 Draw: Throughout the year, students are introduced to a variety of writing styles, one of them being “How To” paragraphs. Artistically, students are shown this style in a very low key, yet academically appropriate way. Have students choose to be either an illustrator or a cartoonist. Provide them opportunities to complete two lessons and then expand on those artistic skills that they just gained and apply them to the free zone area. Ask students to draw a crazy monster, space object or animal of their own. If multiple people are using the iPad, make sure artist accounts are locked so preferences can not be changed. 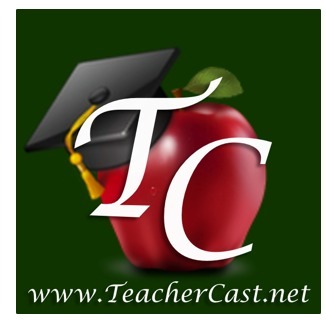 Once their individual creations are finished, share them via email to the classroom teacher. He/She can print and store them. Students should then return to their iPad device and begin typing a “How to Draw” paragraph. This paragraph would then be printed and shared with a classroom partner. As the partner, they are expected to read the paragraph and then open 1-2-3 Draw app and follow the directions within the paragraph. The objective is to have two illustrations that look alike, assuming directions were written clearly and understood properly by their partner. Overall, Applicable2U was impressed with the capabilities that 1-2-3 Draw has to offer a classroom environment. How often do students get to show their creative side? For some, this application will open a child up academically in a whole new way. Just keep in mind that drawing with pencils, crayons, and markers is very different on a computer and takes time, the same holds true with an iPad. Those integration projects mentioned above are just some of the possibilities that this educational app has to offer. Are you a teacher looking to use technology across the curriculum, then 1-2-3 Draw would be an excellent addition to your iPad device. Be sure to visit Peel Productions website here. As of today, April 18th, 1-2-3 Draw is free, so begin your download here!